Until now, Americans have been losing the battle of the bulge. More than a third of all adults and 17 percent of young people are obese, according to the experts, and many of them have been consigned to troubled lives with obesity-related health problems such as type 2 diabetes, coronary heart disease and stroke, hypertension, arthritis and even cancer. Without major government and private intervention and a sea change in many Americans’ unhealthy eating habits, the adult obesity rate could reach 50 percent by 2030, according to one study. The cost to society in terms of damaged lives, soaring health care costs and diminished economic growth and productivity is staggering. A new analysis prepared for The Fiscal Times by Scott Kahan, director of the National Center for Weight & Wellness at George Washington University, pegs the total cost of obesity – including direct medical and non-medical services, decreased worker productivity, disability and premature death – at $305.1 billion annually. Those direct medical costs - include counseling, outpatient and hospital visits, a range of bariatric surgical procedures, new treatment, nursing home care, rehabilitation and hospice – account for $190 billion of the annual costs, according to Kahan. The non-medical costs, including health education and behavioral change, add $50 billion to the annual tab. Finally, absenteeism and sub-par productivity in the workplace costs an additional $65.1 billion a year. Kahan’s study, which he based on a wealth of research dating back to 1998, eclipses previous estimates of obesity’s societal and economic costs. The total would be much higher – by at least an additional $300 billion a year – if “intangible costs” associated with pain and suffering from obesity and obesity-associated conditions were added – but they are difficult to monetize. Still, those additional costs would push the grand total to $605 billion a year. Addressing the obesity crisis poses many challenges to private and public health care policy makers as well as millions of Americans struggling to get their huge waste lines under control. There also needs to be a major change in attitude within the medical profession, which hasn’t required cost effectiveness as a prerequisite to having access to treatment - except when it comes to obesity. Obesity has been stigmatized for decades by government health officials, the medical profession and the insurance industry, which has resulted in a patchwork of policies for covering preventative measures and treatment. For example, while both Medicare and Medicaid cover some surgical procedures, obesity treatments are not included in the “essential health benefits” of the Affordable Care Act. However, the ACA does require most individual plans to cover preventative services like screenings and counseling. Medicare Part D, the prescription drug benefit, does not pay for weight loss drugs. Some private health care plans cover bariatric surgery, drug treatment and nutritional counseling, but many others don’t. “Recognizing obesity as a disease will help change the way the medical community tackles this complex issue that affects approximately one in three Americans,” Dr. Patrice Harris, a member of the AMA’s board, said in a statement. Harris indicated that the new definition would help combat Type 2 diabetes and heart disease, which are linked to obesity. Then last week, the AMA followed up with a pronouncement encouraging private insurers and the government to expand their health coverage to include evidence-based treatments such as bariatric surgery and new drug treatments to help millions of Americans bring down their weight and improve their health. “It’s a big step in the right direction,” Morgan Downey, publisher of the online Downey Obesity Report, said in an interview. 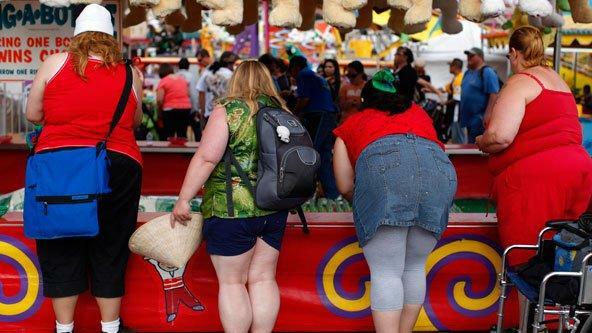 Advocates for overweight Americans are hopeful that with the American medical establishment now behind it, efforts to push Congress, the executive branch and the insurance industry to gradually expand coverage of preventative measures and treatment for obesity will begin to gain traction. For the most part, drug treatment and the use weight loss surgery have become the procedures of choice in treating obesity. Two new obesity drugs that were introduced in the past year or so - Qsymia and Belviq – have shown to be effective, according to experts, although they still aren’t widely prescribed by physicians. A third obesity drug is awaiting Food and Drug Administration approval. In the case of bariatric surgery, weight loss is achieved by actually reducing the size of the stomach with a gastric band or through removal of a portion of the stomach – or by rerouting the small intestine to a small stomach pouch. Some long-term studies have shown that the surgery causes significant long-term weight loss, recovery from diabetes and improvement in cardiovascular risk factors. The cost of the surgery ranges widely, although the U.S. National Institute of Diabetes and Digestive and Kidney Diseases estimates that it costs on average of $25,000, according to U.S. News & World Report. Treatment with laparoscopic gastric banding surgery – the least invasive and generally least effective in patients with obesity and diabetes - was estimated to yield net medical and economic savings of $26,570 to $34,160 per person over five years, according to Kahan’s analysis.